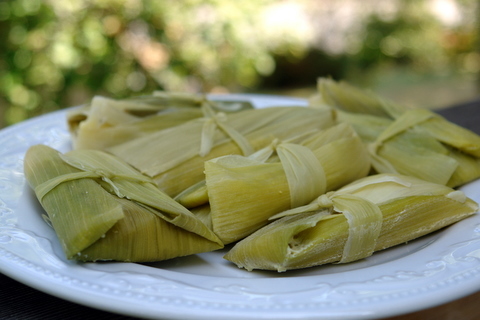 Since today is the last day of ¨Food Month¨ at Kiva, I´d like to share a recipe for humitas, corn-cheese tamales that are common throughout the highlands of Ecuador. Humitas are often made during the months of the corn harvest (August and September) when corn is abundant. They are often enjoyed in the evenings as a light snack accompanied by a hot cup of coffee. Begin by husking 6 ears of corn. Save all corn husks in whole pieces, as they will be used later. Boil the corn husks in a large pot of water for 1 minute, then remove. Remove the corn from the cob by hand. Mix half of the corn in a blender with the onion until an even consistency is obtained. Mix the other half of the corn, the butter, baking powder, eggs, and corn flour in a blender until an even consistency is obtained. Combine the two mixtures and add the cheese. Add ¼ cup of the corn puree to one or two corn husks and fold to seal (one end of the tamale should remain open after folding). Repeat this step with 34 corn husks and the rest of the corn puree. Tie the tamales with thin strands of shredded corn husk so the sides do not open while cooking. Fill a large pot with 2 cups of water. Cover the vapor collection basket that sits at the bottom of the pot with half of the corn husks. Fill the pot with tamales facing vertically with the open parts facing upward. Cover the tamales with the remaining corn husks. Cover the pot and bring the water to a strong boil. Reduce the heat and cook the tamales for 30 minutes, or until they become firm. Entry filed under: blogsherpa, Cooperativa San Jose, Ecuador, KF12 (Kiva Fellows 12th Class). A Taste of Liberia	Does Microfinance Empower Women?